You are here: Home / Linking Building Strategy Articles / Link Penalty Anxiety? “Help, our site was penalized by Google. We used to be ranked on page one but now we are on page ten and it’s killing us”. I heard this same plea twenty times at the most recent SES San Jose conference. Some of you live in a state of constant fear that your site is just moments away from being banned or penalized by Google for some linking tactic you have done. Maybe you spammed a blog a few years ago, or submitted to an FFA page. Or hired a link building firm in a third world country. (See Are You A Link Whore?). While it is certainly true that all major search engines are on the look out for suspicious linking activity, it’s also true that very few sites end up getting busted. A far more likely scenario is that the engines have simply stopped giving you credit for links that they used to give you credit for. You haven’t been singled out or penalized at all. When you ranked on page one it was due to a combination of factors, one of which was the type and quality of links pointing back to your site. If Google or any other engine decides that a particular web page is not as trustworthy as they once thought, then if you had a link from that page the engine no longer gives as much weight to that link. Your rank drops as a natural result of the devaluing of the links pointing to you. This is a far different thing that an outright penalty. An outright penalty is when the engine decides your site has purposely set out to fool them, and they take action against you based on the severity of the infraction. If you have never set out to fool the engines, then relax. Rankings shift all the time. You may simply need to acquire a few more high trust links to get right back where you were. Today I rank number one at all three major engines for the phrase Link Building Expert. Have a look. But tomorrow I might not. If that happens, it’s not a penalty. It’s just Google doing its thing. Eric Ward founded the Web’s first service to help introduce web content (URLs) to the specific audience that content was created for, in 1994. Eric then helped Jeff Bezos announce and publicize Amazon.com’s debut launch, and subsequently won the 1995 Award For Internet Marketing Excellence, which was the industry’s “Oscar” back then. 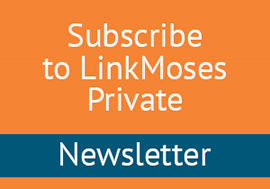 Today, Eric publishes the content linking strategy newsletter LinkMoses Private, and continues to offer link building training, workshops, strategies and M/A counsel. Eric and his methods continue to be written about in numerous publications and featured in college curriculae. Eric has presented at over 160 industry conferences and symposiums. In 2015, Eric contributed to the book Success Secrets of the Online Marketing Superstars, and in 2013 Eric authored the book The Ultimate Guide to Link Building for Entrepreneur Press, now in its 3rd printing. Eric works alone by design from a small office in the shadow of the Smoky Mountains in Eastern Tennessee, and prefers to take a hands-on approach with his clients. Eric creates and has executed content linking strategies for PBS.org, WarnerBros, The Discovery Channel, National Geographic, The New York Times, TVGuide.com, Paramount, and Weather.com. Going back further, In 2008 Eric was one of 25 people profiled in the book Online Marketing Heroes, from Wiley & Sons, Inc., written by Michael Miller, and in 2000 contributed to the book E-Volve-or-Die.com: Thriving in the Internet Age Through E-Commerce Management. Back in the Dark Ages (1997) Eric was named one of the Web’s 100 most influential people by Websight magazine. Of course, in 1997 there were only 104 people on the Web, but Eric was still honored. Eric also contributes to the LinkWeek column for search industry news site SearchEngineLand.com and has also contributes to SearchEngineWatch, Web Marketing Today, ClickZ, MarketingProfs, and print magazines Search Marketing Standard and Ad Age. Eric, his wife, and three children reside in Knoxville, Tennessee.